Caramelizing doesn’t have to be used exclusively for desserts and onions! Caramelized Salmon is an easy way to prepare this popular fish. 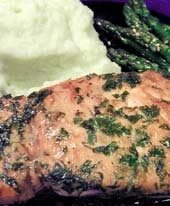 Shown here with Wasabi Mashed Potatoes and Sesame Asparagus. Combine cilantro and ginger. Coat salmon fillets with mixture on both sides and refrigerate for at least 4 hours or overnight. When ready to cook the salmon, combine the soy sauce and orange liqueur in a small bowl and set aside. Heat canola oil in a skillet over medium-high heat. Combine black pepper and sugar in a dish. Press one side of the salmon fillets into the mixture. Sauté salmon, sugar side down, to caramelize the sugar, about 2 to 3 minutes. Quickly, before the sugar burns, pour the orange liqueur mixture into the pan, stirring to dissolve any caramelized bits floating around the pan. Turn the salmon over and lower the heat to medium. Cover the and let salmon finish cooking 5 to 8 minutes longer, until medium. Yes, it will be dark pink in the middle, similar to a medium-done steak or burger. This entry was posted on Thursday, September 6th, 2007 at 6:52 am	and is filed under Carnivore, Main Dishes, Master Recipe Index. You can follow any responses to this entry through the RSS 2.0 feed. You can leave a response, or trackback from your own site.